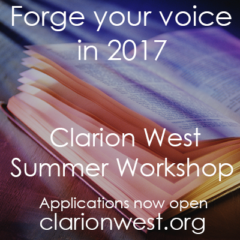 Applications are now open for the Clarion West 2017 Summer Workshop. This intensive six-week course focuses on short speculative fiction, and is taught by six distinguished writers and editors. To learn about the workshop, the application process, and deadlines, please visit the Summer Workshop page.